I have been looking for a photograph of the exterior of Town School for several years, so far without success. Recently, however, in my surfing of the internet, I accidentally came across one. I recognised it instantly, but you can imagine my surprise when the title of the photograph was “Trosnant Board School”. I thought there couldn’t possibly be another school that looked so exactly like Town School in every detail so I contacted Brian Jenkins, the author of “Mill Road” who lived in Trosnant when he was young, and sent him a copy of the photograph. He confirmed that it was quite definitely Town School. He was not aware of there ever being a school in Trosnant. The photograph was black and white and slightly blurred so I enhanced it on my computer and also added some colour and a few figures to liven it up a bit. The door into boys’ cloakroom was closed as was the iron gate which closed off the entry into the girls’ cloakroom. I therefore opened the door and took away the gate. The small plaque just above the shoulder of the man about to cross the road bore the date of the opening of the school: 1838. The narrow alleyway just behind the girl in the yellow dress was the entrance to the girls’ cloakroom. Immediately at the end of the alleyway was a step and to the left a door into the classroom of Mr Rees. If you carried on through the girls’ cloakroom you passed into the alleyway between the back of the school and the high retaining wall on your right. At the end of the alleyway to the right was a flight of steps leading up to the top class playground. On the far left of the playground was “The Bungalow” where Mr Petty taught the 11+ class. Just before the entrance to this building to the left was a wide wooden gate which led into a lane. If you turned right you walked out into Bridge Street. The green door in the photograph, to the left of the young boy, was the main entrance to the school. It led into the boys’ cloakroom. The left hand wall had a row of wash basins; the other three walls were covered with pegs for hanging up our coats etc. At the far end of this room on the right were a few steps which led up past Miss Brooks’ room along a corridor with a door on the left into the playground. On the right were two steps leading into the main corridor. 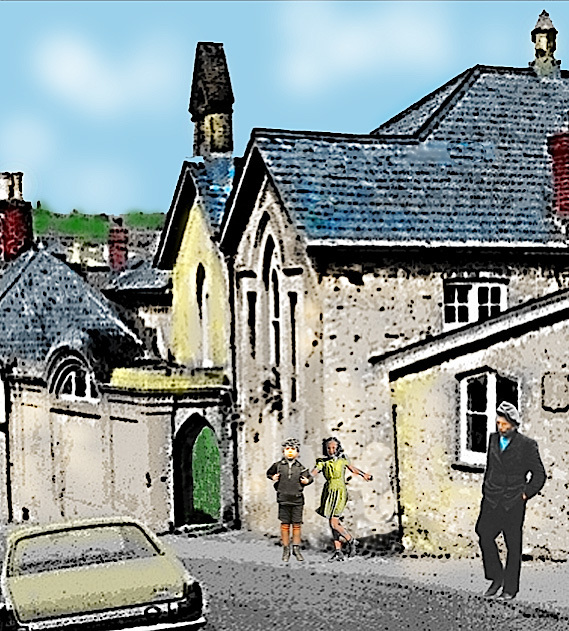 The headmaster’s office was on the right with the school bell tower, visible almost top centre in the photograph, and bell (hardly ever used) above. In a recess to the left was the door into Mr Rees’s room. The other classes ran off the corridor to the right. At the far end of this corridor on the left was the entrance to the Infants’ Department. The only other photograph of the school I have is in the Centenary Booklet and is of the playground. It appears elsewhere on this blog. If anyone has any more photographs of the school I’d be pleased to include them here.